We are proud of our commitment to new technology, such as “design-build” and computer aided drafting. Taking advantage of the latest technology allows our projects to flow smoothly from design and fabrication to installation and startup. From industrial manufacturing facilities, apartment complexes to schools and medical facilities, Camblin’s can get the job done in a manner reminiscent of the “good old days.” A lot has changed at Camblin’s since 1918, but one thing that will never change is our commitment to quality service. Heat Pumps: WaterFurnace geothermal equipment continues to lead the industry in efficiency and dependability. We have a complete line of products to choose from. We also provide premium Carrier or Trane air-to-air heat pump products. Our service department is equipped to service, replace or repair any brand of heat pump. HVAC: We have access to any make and model to meet your HVAC needs. Most of our equipment can be shipped to our warehouse in less than 2 weeks, some common models are available in one day. Pipe Fitting: As commercial contractors, familiar with this industry, we have established credible commercial fire sprinkler contractors and are happy to provide this information as needed. Plumbing: Our licensed plumbers on staff are to ready to tackle your plumbing needs with a vast array of stock piping materials and as well as some hard to find items. Cast iron, PVC, steel, schedule 40 and 80 pipe, and copper are just a few of our in-stock inventory. Sheet Metal: We have a full service sheet metal shop at your disposal. From one fitting to a complete job, custom ductwork is our specialty. Med Gas: We are pleased to be the only contractor in Southwest Iowa that has a licensed and certified medical gas installers. Both have gone to the mandatory 4-day class, as well as annual re-certifications on both installation techniques and brazing inspections. Backflow Preventers: Most cities are now requiring backflow prevention on all new water services to commercial buildings, as well as some residential installations. This requires annual inspection on your preventer once every year. We have two state certified backflow preventer inspectors on staff for ease and convenience. Energy Analysis: Did you know that most energy providers have programs available to look at your energy usage? Some studies are very basic, others are very in depth. Once completed, the report will give you the information needed to decide which items to change that promote the biggest savings. Contrary to popular belief, most energy companies want you to use energy wisely! If they can make the necessary power with their existing faculties, your energy cost can remain lower. Pipe insulation is just one example of an energy saving “devise” that is often overlooked. Boiler thermal “blankets” often pay for themselves in less than two years in savings. 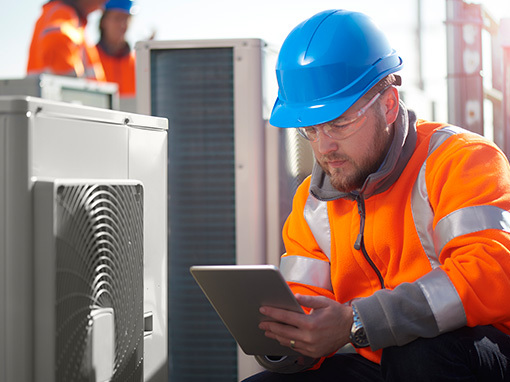 We offer from simple to comprehensive Service agreements and Maintenance programs to meet all HVAC needs. From quarterly filter changes to technical inspections on any HVAC equipment.